The number of people living in rural areas continues to slide, according to the latest population estimates by the U.S. Census Bureau. People have left rural America in decades past. The big difference now is that the number of births in rural areas isn't keeping pace with the number of deaths. 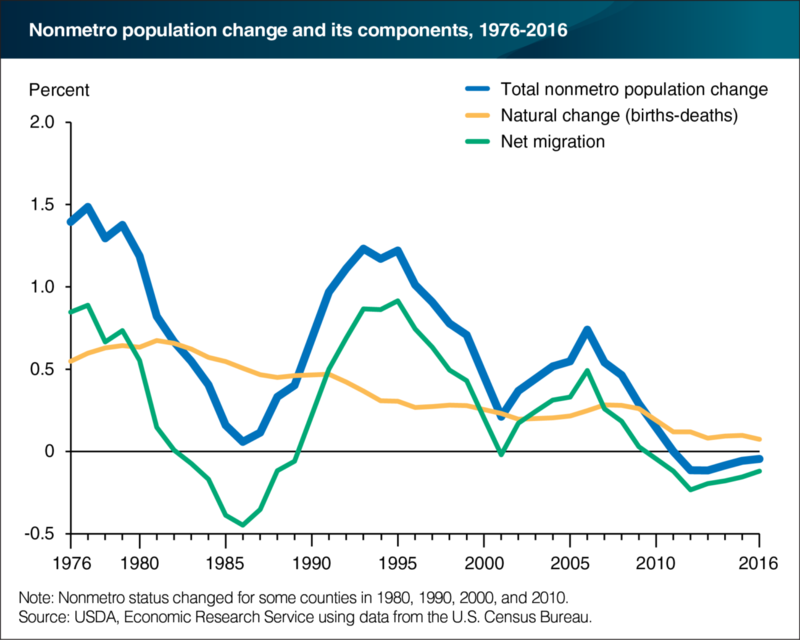 EDITOR’S NOTE: The population in rural America (nonmetropolitan counties) has declined for a record-breaking sixth straight year, as we’ve previously reported. Geographer John Cromartie of the USDA Economic Research Service looks at the factors that go into population change at the county level. Rural areas aren’t losing population just because Americans are leaving the countryside and moving to the city. What’s different in the last six years is that there are more deaths than births in rural America, and the change in “natural increase” is a key factor in bringing down rural population overall. 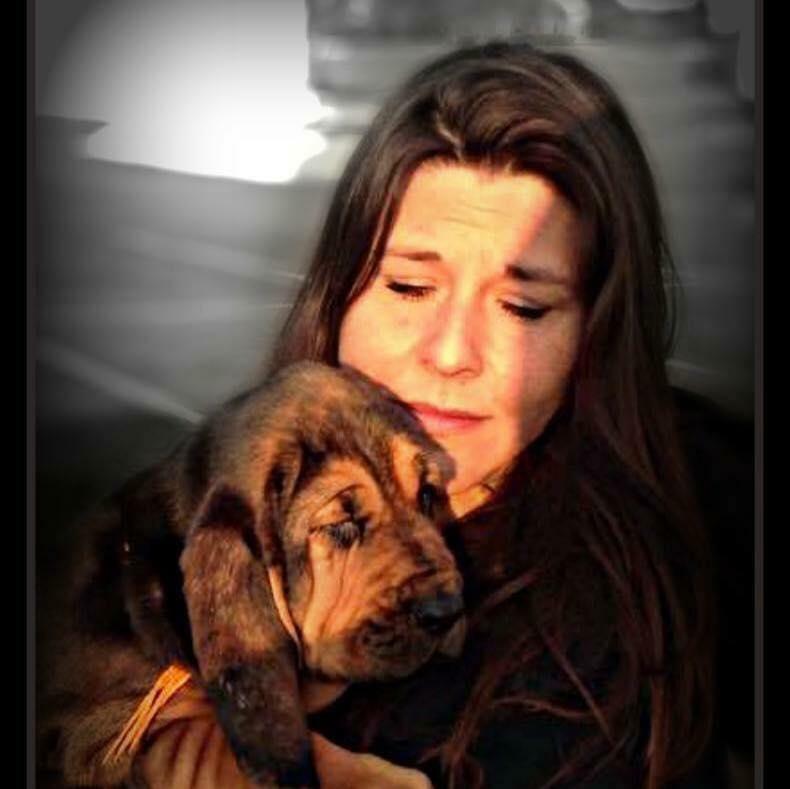 This article is condensed from Cromartie’s report just published in Amber Waves, the ERS publication. 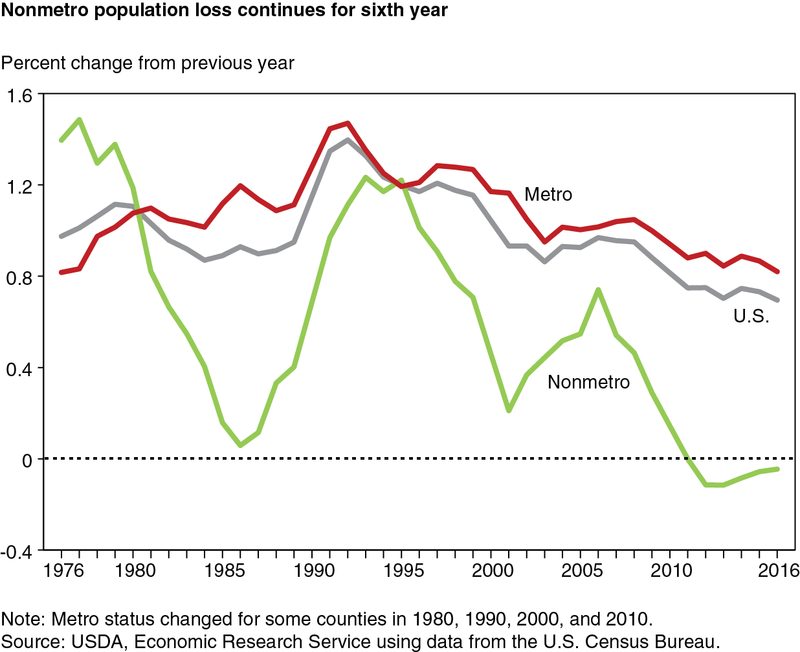 Population growth rates in rural counties have been significantly lower than in urban (metro) counties since the mid-1990s, and the gap widened considerably in recent years. Between 2006 and 2016, annual rates of population change in rural areas fell from 0.7 percent to below zero, while urban rates fell only slightly from 1 to 0.8 percent. County population change includes two major components: natural change (births minus deaths) and net migration (in-migrants minus out-migrants). While natural change has gradually trended downward over time, net migration rates tend to fluctuate in response to economic conditions. Since 2010, the increase in rural population from natural change (270,000 more births than deaths) has not matched the decrease in population from net migration (462,000 more people moved out than moved in). Net migration rates were often much lower in the past—during the 1950s, 1960s, and 1980s—but were always offset by higher rates of natural change. Population growth from natural change (more births than deaths, also known as natural increase) was the norm historically. But declining birth rates, increasing mortality rates among working-age adults, and an aging population have led to the emergence of natural decrease (more deaths than births) in hundreds of U.S. counties, most of them rural counties. Lower rates of natural change resulted in 325 rural counties experiencing sustained natural decrease for the first time during 2010-16, adding to 645 rural counties with natural decrease during 2000-09. Areas that recently began experiencing natural decrease are found in New England, northern Michigan, and high-poverty areas in the southern Coastal Plains. 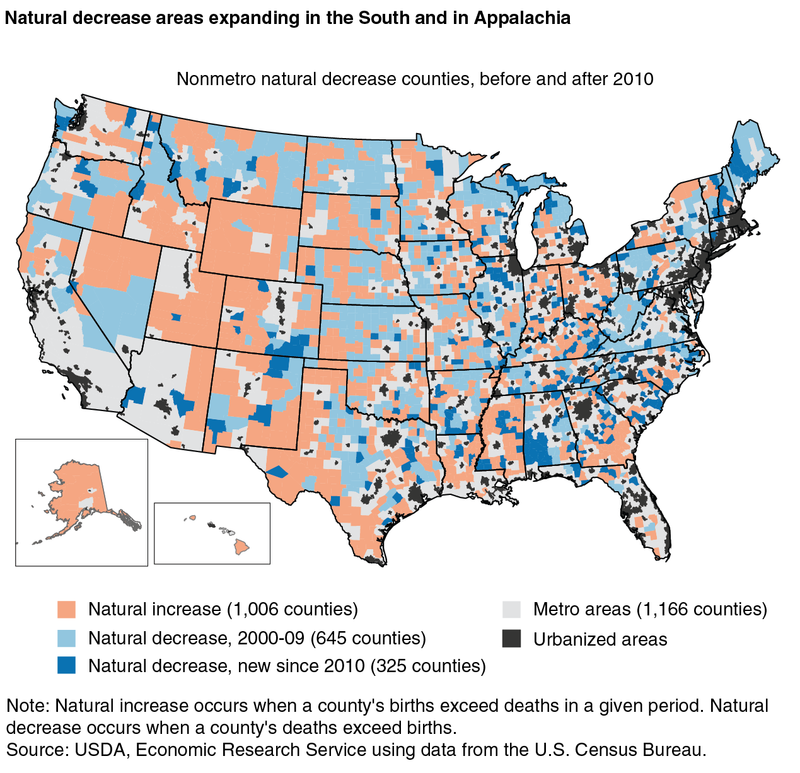 Such counties also are found in and around the margins of Appalachia, expanding a large region of natural decrease extending from Maine through northern Alabama. Opportunities for population growth and economic expansion vary widely from one rural county to the next. A comparison of maps for two time periods (2002-08 and 2010-16) shows that new regional patterns of growth and decline have emerged in recent years. The first map shows geographic patterns of population growth that held sway for decades. Population loss affected most rural counties dependent on agriculture, in the Great Plains from eastern Montana to west Texas, extending into Corn Belt areas of Iowa, Illinois, and other Midwestern States. Population loss also affected areas of relatively high poverty in the southern Coastal Plains from eastern Texas to Virginia, and in Appalachia from eastern Kentucky through upstate New York. Rapid population gains in rural counties near large and medium-sized metro areas reflected long-term suburbanization trends that transformed hundreds of rural areas and small towns. Rapid growth was also concentrated in recreation areas with attractive scenery and retirement destinations, such as throughout the Rocky Mountains and Pacific Coast regions, in the Ozarks and southern Appalachia, and in Florida. The second map shows declining population trends and geographic shifts since 2010. In 2010-16, rural population decline occurred in 18 out of 23 eastern States that had been growing during 2002-08. 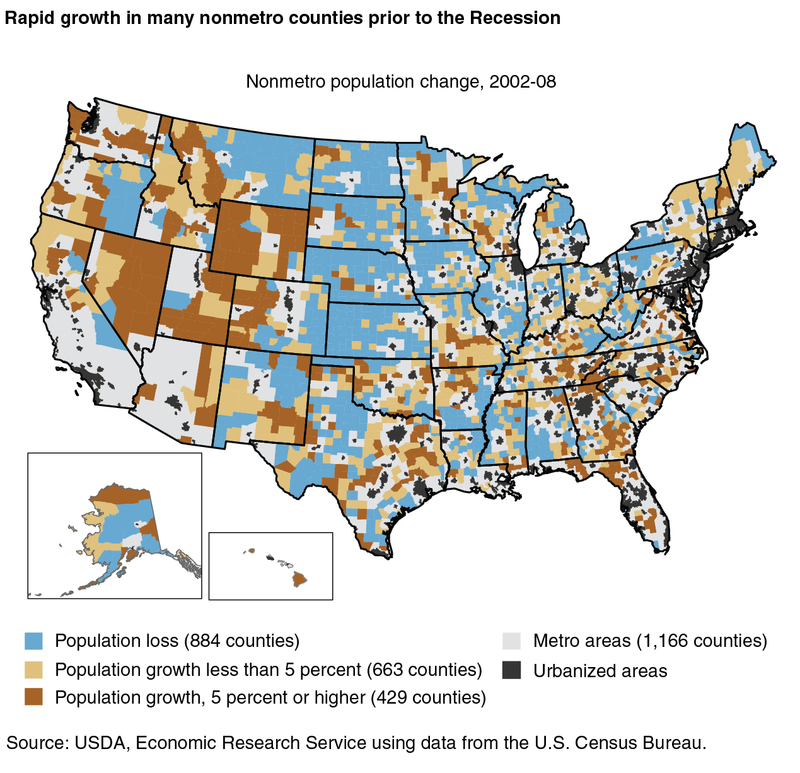 Population growth also slowed considerably in the Mountain West for the first time in decades, affecting numerous counties in Utah, Idaho, Nevada, and elsewhere. Overall, only 138 rural counties grew by 5 percent or more since 2010, compared with 429 counties prior to the Great Recession. Spurred by an energy boom, large sections of the Great Plains turned around decades of population decline. This is most visible in sparsely settled regions such as the Williston Basin in western North Dakota and eastern Montana. However, the most recent year of data (2015-16) shows a significant reversal in population growth in these energy-sector regions, in line with recent cutbacks in oil production. This first-ever period of overall rural population loss may be short-lived depending on the course of the economic recovery. The cyclical downturn in net migration that began in 2007 bottomed out in 2012, and improving population trends since 2012 coincide with a marked improvement in rural employment growth. Even if temporary, this small but historic shift to overall population loss highlights a growing demographic challenge facing many regions across rural and small-town America: population growth from natural increase is no longer large enough to counter cyclical net migration losses. This story was originally produced by our publishing partner The Daily Yonder. 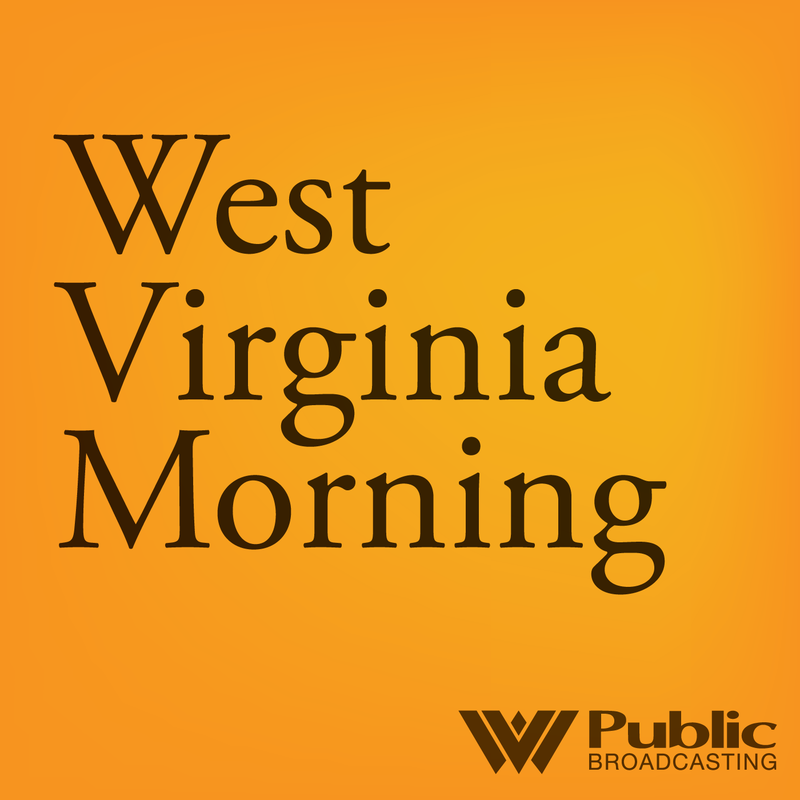 On this West Virginia Morning, we’ll meet the next person we’ll be following in our ongoing series, The Struggle to Stay. Dave Hathaway is a coal miner in the very southwestern corner of Pennsylvania. Back in 2015, he lost his job at the coal mine he’d worked in. Then, he began looking for work. But what about Dave’s family? We teamed up with The Allegheny Front's Reid Frazier for this next installment of The Struggle to Stay. Experts and advocates gathered in Morgantown yesterday to talk about policy issues related to children’s health care. As Kara Lofton reports, most of the conversation was centered around the Children’s Health Insurance Program -- also known as CHIP. The nation is halfway between census years. The next decennial U.S. Census is coming up in 2020. And for the first time, it'll be offered online. That means census officials have lots of work to do to make sure no one is left behind. For several months this year, the Rev. Thurmond Tillman has been working for the Census Bureau. His main gig is at First African Baptist Church in Savannah, Ga., where's he's been a pastor for more than 30 years. The sun isn't quite up, but Tillman is already on the road. He crisscrosses coastal Georgia and South Carolina in his black sedan.